Here is a simple do it yourself project of a little melody maker useful for all those hobbyists interested in making electronic toys or fancy gizmos for their kids. For extreme simplicity and flexibility, the circuit is built around the inexpensive microcontroller board ‘Digispark Attiny85 (Rev2)’. By default, the finished circuit will play the “twinkle twinkle little star…” melody through a small piezo-transducer. Hardware setup of the melody maker is surprisingly very very simple. 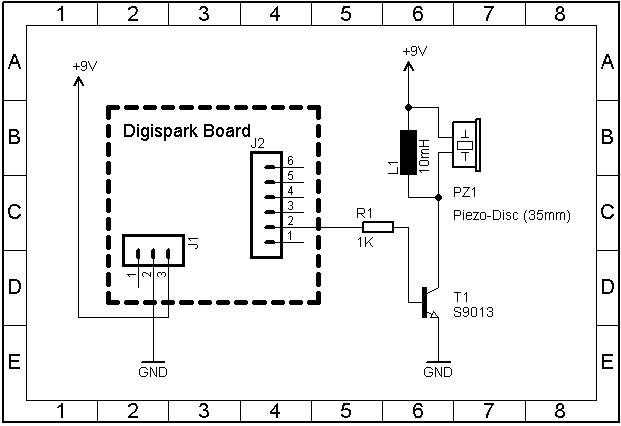 All you need is to complete the setup as shown above, and upload the given code to Digispark board through your Arduino IDE. 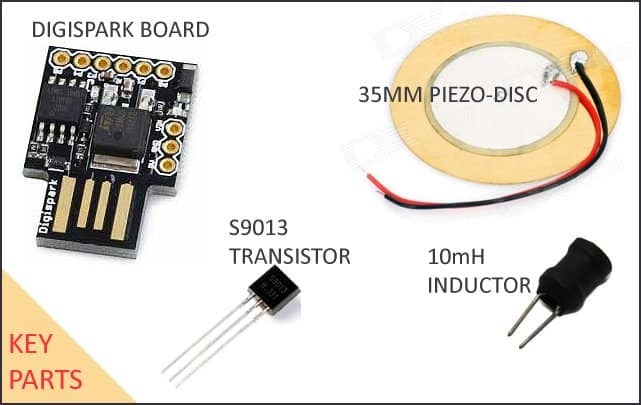 In the setup, PB1 (PWM,504 Hz) of the Digispark is used to drive the piezo-transducer just because the onboard red LED is also wired to the same pin. In case you don’t want the light effect, change the code to use the next port PB0 (PWM,504 Hz) to drive the sounder. Note that, PB0 is actually pin 1 of the digispark’s 6-pin header while pin 2 of the header is linked to PB1. The code is in the format of the common Arduino sketch. It’s very simple so that you can tweak it well to your specific requirement and taste. Happy coding! * An inspired work – Adapted sketch for learners! This article is in fact a shortcut for making melody using a microcontroller. Here we are taking the advantage of Attiny85 processor’s – the core of Digispark – capability to produce tone signals in order to play the melody. Is everything perfect? No promises! Still there is a lot to learn and try!! !